The Xbox One may be getting external hard drive support in the near future. A new screenshot shows this feature in action. The screenshot was posted on Reddit by XboxOneDev, a verified member of the console's development team. It shows a pop-up window that says "External Drive Ready." The console's storage space is currently 29.4% full with 585.9 GB remaining - meaning it has far more than the usual 500GB of storage. Accompanying the screenshot was a simple message: "Soon..."
Microsoft's Larry "Major Nelson" Hryb said last month that external game storage was in the works. Microsoft has yet to officially announce the feature, though. Currently Xbox One owners can only use the console's internal 500GB hard drive for storage. Only about 362GB of that space can actually be used by gamers. An Xbox One can hold roughly 20 games before the hard drive is filled. Xbox One owners can swap out their console's hard drive for a third-party drive with greater capacity. However, doing so voids your warranty. External drives provide expanded storage without requiring gamers to crack open their new console. Microsoft added USB storage support to the Xbox 360 five years after that console's launch. I'm glad to see that they're being quicker about it with Xbox One. It's a more pressing issue on the new console due to the rise of digital sales and the ballooning size of games. Furthermore, Xbox One games need to be installed to the hard drive even if you buy the game disc. The Xbox One tends to get one major system update per month. The May update went live this weekend without external HDD support so we may have to wait until next month at the earliest for this feature. 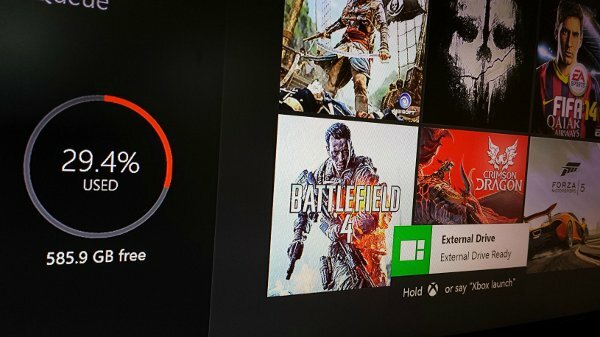 Xbox One's June update is shaping up to be great even if it doesn't include new storage options. The patch will remove the Xbox Live Gold requirement for many entertainment apps including Netflix and HBO Go. Players who do keep their Gold membership can get free games and exclusive discounts on Xbox One. There's a chance that Microsoft will add external hard drive support to the patch's list of changes before it goes live, though.